The Versalab GRINDER and PRESS provide the freshest, finest espresso flavor available anywhere. But there are many reasons you should have these products in your shop. 1. Consistency. Shot after shot the same. The very exacting grind, repeatable volumetric dosing, and the PRESS for the most repeatable tamp ever. The better flavor delivered quickly - that gains you customers - and the many fewer wasted shots – that saves you money. 2. Speed. Using two Versalab GRINDERS and one Versalab PRESS, a single barista can easily prepare two drinks every 70 to 76 seconds, the equivalent of one drink every 35-38 seconds. The relatively long grind time, required for outstanding flavor, disappears with the overlap of the two machines and the speed of the PRESS. 3. Reliability and ease of maintenance. All parts of these products are extremely robust, of machine tool or instrument quality. With over 11 years of selling the GRINDER and PRESS, their reliability is proven. Keeping the machines clean and changing the flat burrs every 400 pounds or so of beans is basically it. 4. Cost. You need two grinders anyway. Put two dosing hoppers on each of the two Versalab grinders and have one on each be decaf, or whatever -- your choice. 5. Employee health. Repetitive stress injuries are a serious problem for baristas and therefore for coffee shop owners. The use of the PRESS, as well as the lack of dosers on the grinders, has eliminated this problem. 6. Easy training. Forget teaching how to repetitively tamp coffee to 35 pounds force. And teaching each barista to do exactly the same tamp. The PRESS does it for you. Dosing hoppers - the advantage of this design over conventional hoppers is that the beans don't sit on top of the burrs, with partially ground beans going stale and mixing in with the grind of fresh beans. These hoppers use a volumetric dose delivery bar. Push the delivery bar back and a measured quantity of beans falls into the dosing hole in the delivery bar. Pull the red handle forward and this measured dose of beans drops down the chute into the top funnel -- as seen in the Flash slideshow to the left. 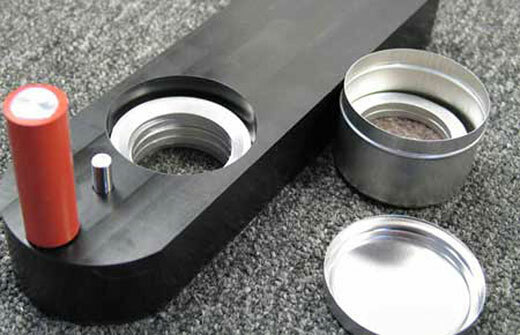 Bushings (NOW DOSING RINGS) inserted into the hole in the delivery bar determine the measured dose. Volumetric dosing can vary from one dose to the next by several tenths of a gram, as the beans nestle together in varying ways. For perfectly repeatable dosing every time, overdose and strike off the excess in the classical manner. The Versalab GRINDER and PRESS provide the freshest, finest espresso flavor available anywhere. There are many reasons you should have these products in your shop. • CONSISTENCY. The very exacting grind, repeatable volumetric dosing, and the PRESS for repeatable tamp make shot after shot the same. Better flavor delivered quickly - that gains you customers - and many fewer wasted shots – that saves you money. • SPEED. Using two Versalab GRINDERS and one Versalab PRESS, a single barista can easily prepare one drink every 35-38 seconds. The relatively long grind time, required for outstanding flavor, disappears with the overlap of the two machines and the speed of the PRESS. • RELIABILITY, EASE of MAINTENANCE. All parts of these products are extremely robust, of machine tool or instrument quality. With over 11 years of selling the GRINDER and PRESS, their reliability is proven. Keeping the machines clean, changing the flat burrs every 400 pounds or so, and periodically the belt, is basically it. • EMPLOYEE HEALTH. Repetitive stress injuries from tamping are a serious problem for baristas and therefore for coffee shop owners. The use of the PRESS, and the absence of dosers on the grinders, eliminates this problem. • EASY TRAINING. Forget teaching how to consistently tamp coffee. The PRESS does it for you.